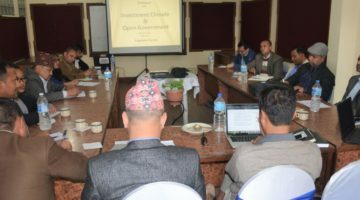 At a time when online media were struggling to establish their identity with the spurt of media in Nepal, the study report has given recognition to the online media, editor Sushil Pant at www.lokaantar.com shared happiness. They were speaking at an interface Freedom Forum organized on Women’s Presence in Nepali Media in Kathmandu on June 28, 2018. 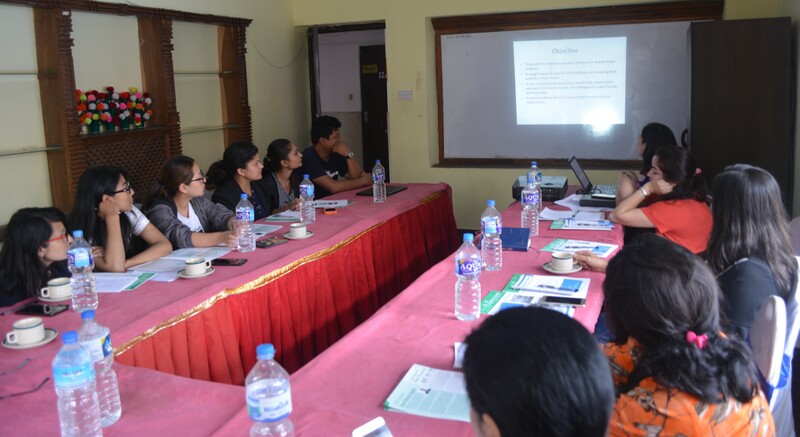 During the program, report of the monitoring of news byline, contents sources, presentation of women issues in major national dailies published from capital city, and from provincial level and six online media was presented by FF. The study period covered three months from January to March 2018. As per the report, women were underrepresented in the Nepali media contents with only 9% in bylines and 13% as news sources in 2,397 new stories. Majority of female bylines and sources were found in the social and legal news except for maximum female sources in economic news from online. On the occasion, editor at www.hakahakionline.com, Mr Kamal Dev Bhattarai stressed that while the working environment was improving nowadays, media houses should always encourage female journalists, and female journalists too need to be assertive on mainstream reporting. Lack of inclusive policy and orientation at newsroom are important factor behind less representation of women in media, he further informed. Young reporter for My City supplement of Republica daily, Ms Sonam lama, praised the study. 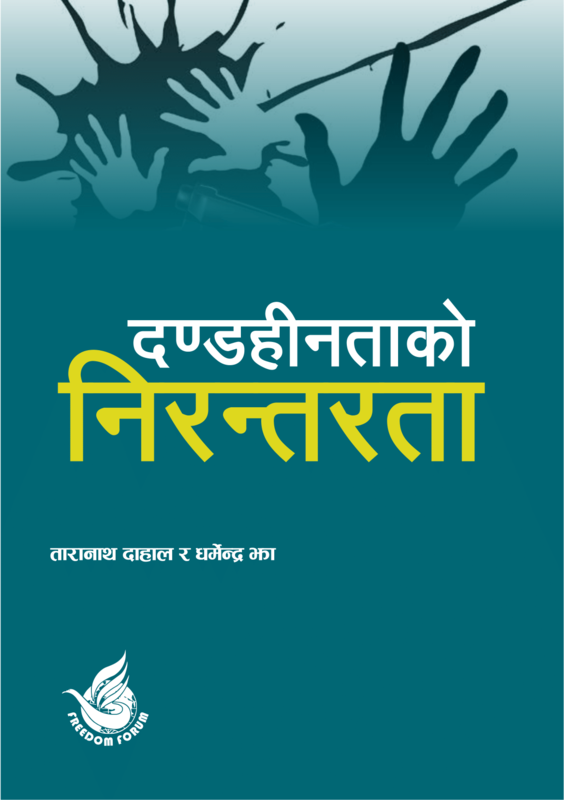 “A progressive approach will be a tool for increasing women’s participation in Nepali media. But, we should also be proactive, responsible and forward for our self-recognition,” she argued. Section Officer at Department of Women and Children, Mr Shreedhar Gyawali, said men should be engaged to empower women in media and allocating a separate page for ‘women only’ may encourage women. The objective of interface is to bring media editors, journalists and concerned authorities together and discuss upon the issue to find way forward for gender equality in media. During the program, participants recommended that provision of incentives and training for female journalists would also motivate them for coming to mainstream media. Conducting research on dropout rate of female reporters in media over years and providing training on lead writing to journalists would help increase their presence in media, they suggested. Earlier, during the female only interface on the same topic, FF organized on May 31, 2018, the participants had said social beat was hastily generalized as ‘feminine beat’, most of the females were reporting on it, resulting in lower visibility compared to male colleagues. “Isn’t it high time we mainstreamed social issues- the issues of women and children- now? Nepal is now in relatively stable situation. So, we can focus on social issues,” said Ms Rama Luitel, encouraging the fellow reporters, arguing that social news helps bring bigger change than the political news does. When some female reporters complain that they are generally given social beats, she responded there was no point in belittling social beat reporting. Social beat is more important than others, she underscored. Similarly, journalist Durga Karki said, “Male reporters should be instructed to do social beat, so that they are learn more on sensitivity of women and children.” According to her, perspective of male and female reporters on a same issue is different, so the presentation of the story may vary. In view of female’s short stay in media, reporter to Annapurna Media Network, Srijana Khadka said, “I’m working on a thesis on ‘Career of female journalists after marriage in Nepal’ to dig out more issues as how difficult the women journalists’ life is in media before and after marriage in Nepal.” She also said the news related to politics and government was dominating Nepali media.